Welcome to Laboratory of Vaccine Materials, National Institutes of Biomedical Innovation, Health and Nutrition. We are trying to reveal uniqueness of mucosal immune system for better understanding mucosal immunology as well as apply the knowledge to the development of mucosal vaccine for the better regulation of infectious and allergic diseases (go to "Research"). In addition to our laboratory, the project leader, Jun Kunisawa, work for The University of Tokyo, Osaka University, Kobe University. Therefore, our research group members are constituted of various backgrounds, facilitating interaction with each other on the basis of different research motivation but all for contribution to mucosal immunology where it has been one of the biggest subjects in immunology. Accumulating evidences indicate that mucosal immunity-based vaccine treatment and immunotherapy are not just possibility but rather effective. Dr.Kunisawa was installed as Director of Center for Vaccine and Adjuvant Research. Dr.Kunisawa received "Takahashi Encouragement Award" of The Japanese Society for Vaccinology. Dr.Nagatake received Best Presentation Award Winners 2017 of The 46th Annual Meeting of The Japanese Society for Immunology. Dr.Kunisawa received Award of Japanese Association for Food Immunology. Dr.Kunisawa received Young Researcher's award of Mishima Kaiun Memorial Foundation. The activities of Dr.Kunisawa were printed in Nikkei Health in July, 2016. The systematic name changed to "National Institutes of Biomedical Innovation, Health and Biomedical" on April 1st. The activities of Dr.Kunisawa were printed in Asahi newspaper on Nov 6 & 13. 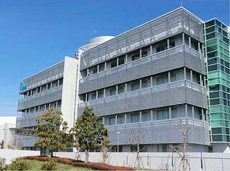 Laboratory setup & Opening party was held. Copyright © Laboratory of Vaccine Materials, National Institutes of Biomedical Innovation, Health and Nutrition. All rights reserved.